Figure 1. 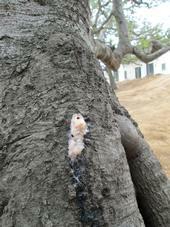 Oozing produced by fungal infection of a cherry branch pruned during a previous cool season. Most people think about pruning fruit trees during the winter since the branch structure is most visible and winter is considered the traditional time to prune deciduous trees. 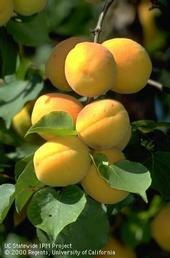 Actually, pruning fruit trees mainly during the growing season is a good practice and with some species such as apricots and cherries, pruning between September and March in northern California could lead to detrimental canker diseases.